Wilhelm Furtwängler conducted Beethoven’s Ninth Symphony more than a hundred times. In August 1954, three months before his death, he directed his last performance in Lucerne, which proved to be an “elemental musical event” (Neue Zürcher Zeitung). Alongside the brilliant Philharmonia Orchestra and a stellar cast of soloists, Furtwängler accentuates the visionary character of this monumental score. Comparing this 'Lucerne Ninth' to Furtwängler’s other benchmark interpretations, such as his famous performances in Berlin (1942) and Bayreuth (1951), allows for a closer examination of the constants and changes in his very subjective view of Beethoven’s final symphony. For the release of this concert recording as part of the series 'Lucerne Festival Historic Performances', the original tapes from the archives of SRF Swiss Radio and Television have been newly re-mastered. The pitch has been adjusted anew so that the recording sounds closer to the original than ever before. This correction in pitch not only changes the lengths of the movements, but also the dramaturgy - the 3rd movement, for example, is almost 17 seconds longer than on comparable recordings, which considerably changes the musical expression. 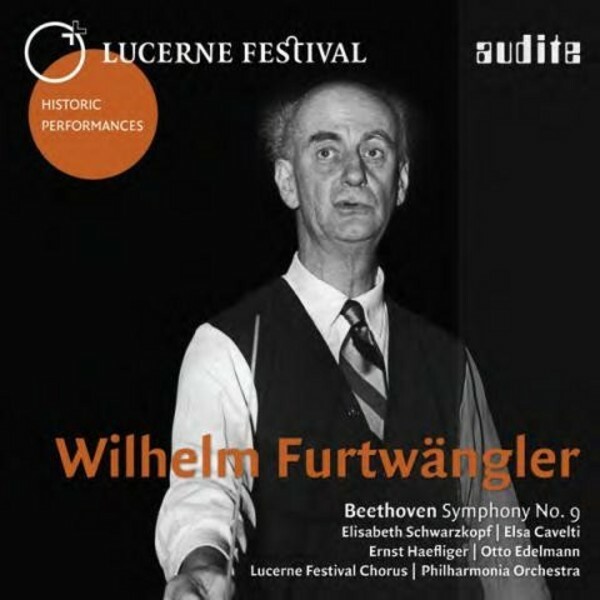 Wilhelm Furtwängler (1886-1954), who spent the final years of his life in Clarens on Lake Geneva, was one of the defining artists of the Internationale Musikfestwochen Luzern, today’s Lucerne Festival. Whereas Arturo Toscanini played an important role during the festival’s founding years of 1938/39, Furtwängler was instrumental in establishing it as one of the then small number of great festivals. In 1944, he came to Lucerne for the first time to conduct two concerts; from 1947 - after his conducting ban had been lifted - until his death, he came to Lucerne each summer (with the exception of 1952) where he enjoyed a special status. Complete with previously unreleased photos from the festival’s archive, the 32-page booklet in three languages contains extensive information on Wilhelm Furtwängler’s work in Lucerne, as well as providing the context for this performance.